As City legend Harry McNally once said before a night out: “At the worst it will be brilliant”. He would never have dreamt his own words would be the perfect description for the gathering that took place after he was laid to rest. But he would have been proud to see us celebrate his life in the way he would have wanted – with a glass of red wine or two, excellent company and a bucketload of happy memories to recall. Earlier on it had been standing room only at All Saints’ Church in Hoole as hundreds gathered to pay their respects at his funeral – from Chester fans in shirts, scarves and hats to football luminaries such as Howard Kendall, John Rudge, Ronnie Moore, Kevin Ratcliffe and John King. There were a good many tears when ex-players John Kelly and Gary Bennett helped carry the coffin into the church to the tune of Harry Nilsson’s Without You. But the printed order of ceremony, including a classic picture of smiling Harry clutching a promotion bottle of champagne, made it clear that this was also a day to celebrate a Chester City hero. Vicar John Kirkland, who led the service, admitted he didn’t know Harry well – but he knew everyone had a personal story to tell and Canon Perris Williams, former rector of Holy Trinity, Blacon, was among those who gave touching personal tributes. Perris recalled the time when Harry missed an open goal during a charity Chester City v clergy match. The words Harry used at the time obviously couldn’t be repeated in church! “Harry’s ready for heaven, but is heaven ready for Harry?”, said Perris, as he finished his sermon. Others talked about various McNally incidents we’ve heard or witnessed over the years, such as crockery throwing at Walsall and the commandeering of wine-tasting evenings. We all knew he lived life to the full. But there was also time to hear about the Harry some of us didn’t know so well – a miner’s son and stonemason by trade – he was loyal friend and ‘father’ figure, who filled out the crossword puzzle every Sunday. It was certainly a time to smile through the tears. Former City heroes Garham Barrow, Stuart Rimmer and Brian Croft helped carry his coffin out after the service and the mourners filed out of the pews to the strains of ‘My Way’ and the famous ‘Match of the Day’ theme tune. Among the current ‘Chester City family’ attending were chairman Stephen Vaughan, secretary Tony Allen, Michael and Sheila Horne, Paul Evans, players Paul Carden, Kevin Ellison and Wayne Brown. The official supporters’ club, the Supporters’ Trust and the Exiles were represented by Barrie Hipkiss, Lee Walton and Kevin Jones, and Pauline Meakins. Other former Chester players included Roger Preece, David Hamilton, Barry Butler, Graham Abel, Brian Croft, Joe Hinnigan, Ray Carter, Billy Stewart and Colin Woodthorpe. 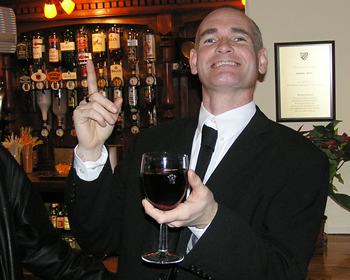 Following the committal near Harry’s Dunham Hill home, the reminiscing continued at The Frog in Upton, where everyone was greeted with a glass of Harry’s favourite Rioja wine to help them raise a toast. He would have wanted us to have a party in his honour and we didn’t let him down! 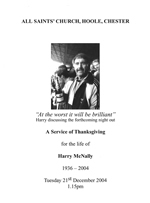 There was barely room to move around the bar so friends, colleagues and supporters had to literally rub shoulders as they raised their glasses in Harry’s memory. For Chester fans from Harry’s era it was like seeing their personal ‘Who’s Who’ before their eyes and, as the wine flowed, the ex-players were all more than willing to roll back the clock. There was talk of famous nights out before and after games, plus the legendary Christmas parties. Gary Bennett soon tired of his funeral tie and began wearing it as a bandana, then a garter. Before long others, including Tranmere goalkeeping legend Eric Nixon, joined in the bandana band. By now ‘Benno’ had tucked his trousers into his socks and was offering to cycle people home. Stuart Rimmer was propped up on the bar recalling the old times and Graham Abel, Brian Croft and Colin Woodthorpe chatted near the buffet. 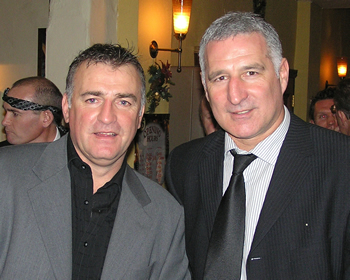 Ex-Chester managers Graham Barrow and Kevin Ratcliffe were also swapping stories. There was only one person missing – Harry McNally. But I’m sure he was there in spirit, watching us from above – he’d no doubt have said it was a “quality” performance and raised a glass in heaven. Rest In Peace, Harry – your memory will live on at Chester City and beyond.